The surgical services department performs procedures in many specialties including: Ortho, general, ENT, GYN, and Urology. The medical center offers the most up to date equipment in every medical specialty. A real time OEC digital image enhancement C-arm with angio-graphic capabilities, The daVinci, Microscopes, laser equipment, and the latest HD video equipment is available for accurate surgical evaluation and treatment in all procedures. Cardiopulmonary rehabilitation is vital for patients with heart or lung concerns. We work closely with your physician to restore an active, healthy lifestyle. We don’t want transportation to get in the way of quality health care. 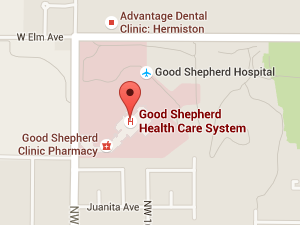 We offer complimentary transport for patients of Good Shepherd Medical Center. Good Shepherd provides high tech surgical services including six major operative suites with modern anesthesia machines and patient monitoring devices. Upon Physician’s order, Home Health Services through TLC Home Health provides quality professional care in the comfort of your own home. Good Shepherd’s Durable Medical Equipment store front is your source for a complete line of home medical supplies and equipment. Good Shepherd Clinic Pharmacy is a complete retail pharmacy for prescriptions, refills and a full line of medical supplies and equipment. Treatment and rehabilitative therapies at Good Shepherd include intravenous, respiratory, physical and occupational, speech, and more.